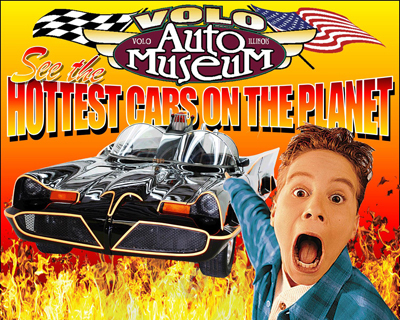 This Volo Auto Museum Coupon is good for $2.00 off all Adult, Child, Senior and Military Admission Tickets to Volo Auto Museum in Volo Illinois. $2.00 off discount will be automatically applied to all admissions at checkout. With over 300 classic, antique, muscle and Hollywood cars on display and for sale they are the second largest auto museum in the world. If you’re not into cars, it’s okay! At the Volo Auto Museum there is something for everyone. See hundreds of cars dating from the early teens thru today. Chrome clad ’50’s classics, tire burning muscle of the ’60’s and ’70’s plus a huge collection of your favorite TV and movie cars. Experience this 35 Acre Theme Park with Fifty thousand square feet of antiques and gifts, military museum, diner, groomed parks and the largest collection of cool cars in the USA!! Open every day, year round. A destination the whole family will love. TV and Movie Cars, Kids Zone, Antique, Classic and Muscle. Shopping, Eating and more. Come Hang Out With Us!